Come home to the Seventh Volume of our inspirational décor magazine that's overflowing with charming accents and creative ideas to beautify any space. 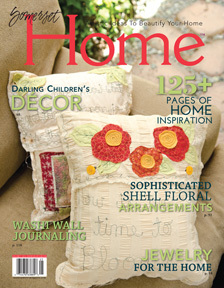 Inside the newest installment of Somerset Home, you will find pillow projects to suit every taste, inventive ways to illuminate any room, and Deb Hodge's jewelry for the home. Décor and function come together in a beautiful magazine that will help inspire you to artistically alter your everyday living space.